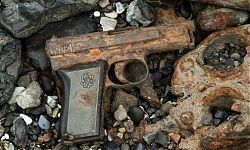 Found on the Isle of Dogs, the third episode sees Johnny proudly find this classic weapon, thought to have been a souvenir of war. For safety reasons, the men must hand it over to the police and clear the area. 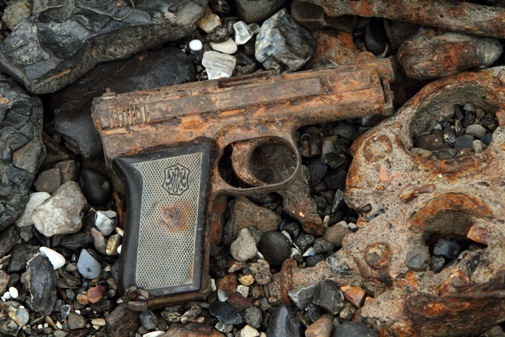 Used during both World War I and II, the find leads the Mud Men on an explosive quest to find out more about the firearms and weapons of the 20th Century. Whilst on the foreshore near a former major shipping yard in Deptford, the pair comes across a cannon ball that may have fallen off a war ship in the boat yard 400 years ago. Found near a German fort in Poland, Steve stumbles across this drill grenade with a fake used for training and practice ahead of battle during the war. Along with Rock God, Steve and Johnny discover rare Roman quern stones in Folkestone used to grind wheat to make bread, potentially dating back as far as the 1st Century AD – almost 2,000 years ago! What are the best things you have found this series? Was that the best moment of the series for you? Watch the next series of Mud Men from January 26th 2012 on the History Channel!